In the next couple of weeks, precisely May 2018, all political parties in the fountain of knowledge state, Ekiti State, will hold their primary elections where the candidate of each political party will emerge. In preparation for the PDP primary election in Ekiti, the incumbent Governor, Ayodele Fayose, is leaving no stone unturned to ensure that the Deputy Governor, Prof. Olusola Kolapo, Eleka, succeed him after the forthcoming election. Though, the decision of the governor to make his deputy his successor came as a surprise to some of his party stakeholders and leaders, who are also nursing the governorship ambition on the same platform of People’s Democratic Party (PDP). This decision of Mr Governor has since divided the party as some of the aspirants within the party are of the opinion that the way the governor and the party exco are going about the candidancy of the deputy governor to be the next governor of the state was unacceptable. This has led to crisis in the party and made the other aspirants to lose confidence in the leadership of Oguntunwase led exco. Fayose’s adoption of the deputy governor led to hostility that engendered a former Senate President, Senator David Mark led-reconciliation committee that met in Abuja. Members included; Senator Enyinaya Abaribe, Ambassador Ibrahim Kazaure , Alhaji Yusuf Ayitogo, Ambassador Fidelia Njeze and Dr. Eddy Olafeso (Secretary). The outcome of the Abuja meeting attended by all the aspirants and the state Governor, Dr Ayodele Fayose, was that “all parties agreed to a free, fair and credible primary to elect a gubernatorial candidate for the July polls.” And Governor Fayose pledged to work with any of the contestants, who emerges at the primary.” Despite the outcome of the Abuja reconciliation meeting, some of the PDP aspirants and a serving senator had defected to the Social Democratic Party (SDP). Though, the governor has prooved on a several occasions, that he is a force to reckon with when it comes to winning elections in the state, having defeated two serving governors hands down. In 2003, Fayose defeated Otunba Niyi Adebayo, who was then AD’s candidate and was recontesting. In 2014, history repeated itself as Fayose defeated the current Minister of Solid Mineral Development, Dr. Kayode Fayemi, who recontested for a second term he is still one of the leading aspirants for the 2018 Ekiti governorship election on the platform of APC. There is no doubt that the governor is on top of the game to ensure that his party, PDP, wins the 2018 election. The question is, how does Gov Fayose plan to make the deputy governor succeed him despite the crisis in his party? Since he announced the adoption of his deputy as the person who will succeed him come 2018. It is no longer news that any governor in Nigeria who is about serving out 2 term would want to be succeeded by a loyal person. Mostly, the outgoing governor would pick who would succeed him. It happened in Akwa Ibom State when Senator Godswill Akpabio was leaving office, he ensured that His Excellency, Udom Gabriel Emmanuel, succeeded him. Earlier, Asiwaju Bola Tinubu ensured the current Minister for Works, Housing and Power, His Excellency Babatunde Fashola, succeeded him in Lagos State. So, Gov. Fayose would not be the first governor to take such a decision. Though, at the beginning of his second term, Fayose had said that he would leave office in 2018 with the deputy governor and all those who serve in his administration for 4 years. This statement, at first, made his supporters and the good people of Ekiti to be in sync with him, but the issue of who would succeed him among the numerous politicans around him has become an issue as he needs someone, who would be loyal to him after leaving office come October 2018. The Governor had earlier said that he sought the face of God, who instructed him to pick his deputy to succeed him. Ekiti State Deputy Governor, Prof. Kolapo Olusola, is a Professor of Building Technology from Obafemi Awolowo University (OAU), Ile-Ife. He hails from Ikere Ekiti in Ekiti South Senatorial District of the state. His research interests are mainly in the field of Alternative Building Materials Development for Housing Construction, Construction Technology and Structural Mechanics. Aside the Governor obeying God’s words, the Deputy Governor was in September 2017 adopted at a party stakeholders’ meeting which had the 177 elected councillors, 177 ward chairmen, the 16 Local Government Party Chairmen, 16 Council Chairmen, Chairmen and members of Boards and Parastatals, members of the State Executive Council, Ekiti House of Assembly members, serving and former members of the PDP State Working Committee among others in attendance. It is no longer news that the deputy governor, Prof. Olusola, is a preferred aspirant among other aspirants in the PDP and he is enjoying the support of his boss. This gives him an edge ahead of other aspirant and if he wins the May primary election and he would officially emerge the PDP’s candidate for the July election polls. Though, the person, who emerges the next governor of Ekiti State is beyond zoning plan, but the decision of Gov. Fayose to support Ekiti South Senatorial aspirant in person of his deputy is a welcome development because the South Senatorial District has not produced a governor since the inception of this political dispensation that started in 1999. The South Senatorial District is made up of 6 local government areas which include Ikere Ekiti, Gboyin Ekiti, Ise-Orun Ekiti, Emure Ekiti, Ekiti South-West and Ekiti East local government council. Out of the local governments, Ikere Ekiti has the highest number of voters after Ado Ekiti. With the look of things, the APC that is the main opponent of the PDP in Ekiti State, is not ready to zone its ticket. Rather, aspirants across the three senatorial districts are given the opportunities to contest for governorship ticket. If the APC’s candidate emerges from either the central or north senatorial district, the outcome would likely be similar to the Ondo 2016 governorship election where Arakunrin Akeredolu won the governorship election. It would be recalled that Akeredolu, who was an APC’s candidate hails from the North Senatorial District, Eyitayo Jegede was PDP’s candidate and he hails from the central senatorial district, while Olusola Oke was the AD’s candidate and he hails from the south senatorial. The fact that both the Central and South Senatorial districts have governed Ondo state was one factor that gave way for the governor to emerge from north senatorial district. With the look of things, the fact that Fayose picked his deputy, who hails from the south senatorial district makes his plan for his deputy to succeed him more easy as the electorate from the south see it as an opportunity for one of their own to govern the state for the first time after 19 years of democracy in Nigeria. A state or country can only be developed if there is continuity in government. A change of government could adversely affect growth of a state as a new party in power has its manifesto to develop the state. Gov. Fayose, who has been described as the architect of modern Ekiti State, has in the last 3 1/2 years, transformed the state with lots of infrastructural projects that are spread across the 16 local government areas in the state. That was one of the reasons Fayose believed that his deputy would sustain the impetus of development which his administration started in 2014. On several occasions, Gov Fayose who had worked tirelessly to ensure his party remains a force to reckon with at the state and national levels has said, “Ekiti state would continue to grow if we have continuity in our governance just as what Lagos State is enjoying today. Gov. 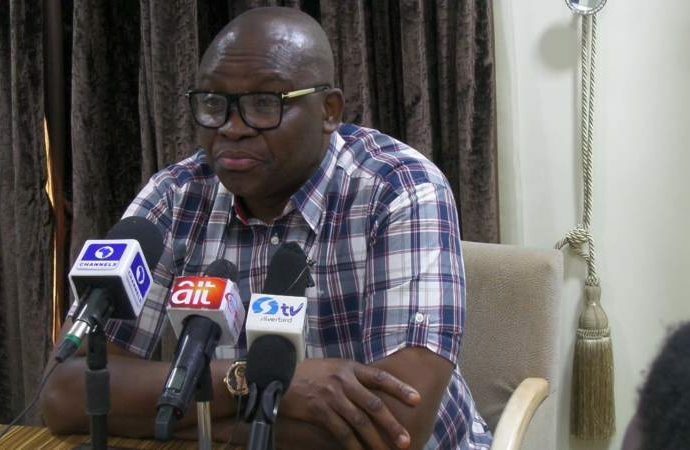 Fayose is the leader of the party in the state and he has the party structure in his grip, which he wants to use to ensure that his own candidate succeed him. Another question is, If the Governor’s choice finally emerges the PDP’s candidate come May 2018, how would the governor make him win the July 14th governorship election as the APC, the major opponent in the race, is allegedly ready to take over the state with the help of federal might irrespective of who emerges the APC’s candidate?. The truth is that the forthcoming election in Ekiti state is a battle between Gov. Fayose and whoever emerges the candidate of APC and candidates of other political parties in the race. The governor recently appointed a former House of Assembly lawmaker and a two-term Commissioner for Environment and former DG campaign officer of Prince Adedayo Adeyeye to be the campaign officer for Kolapo Olusola campaign. So, in a nutshell the governor is on top of the game to ensure his deputy, Prof. Kolapo Olusola, succeed him come July 14. Despite being on top of the game, Fayose has put all his machinery in place to ensure his candidate emerge the next governor.